I have been studying the Model Prayer aka the Lord’s Prayer with my church. It’s been wonderful going through this simple, practical lesson Jesus taught in Matthew 6 on how to pray. I was doing fine so I thought, each week as we went line by line and verse by verse until we reached verse 12 which says “and forgive us our debts, as we also have forgiven our debtors.” I had to be honest with myself about it. 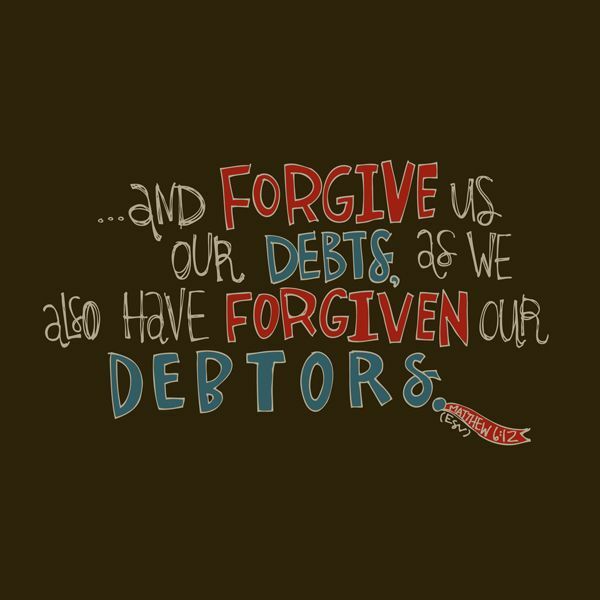 I had not also forgiven my debtors but was quick to ask God to forgive me of my debt. This scripture exposed me, caused me to examine myself and then healed me. How could I come to God and ask forgiveness and not forgive others? Who does that? I do. We do. I had no problem asking God for daily bread, but forgiving others as I had already been forgiven was and is a struggle. God knows it’s not just any old category of “others”, I have to forgive “all others”(one time and multiple offenders, strangers, store clerks, co-workers, friends, bosses, relatives, neighbors, spouses, etc.) Do you have others to forgive? Our relationship with God is impacted greatly by our willingness or unwillingness to forgive others. We must take the first step and ask the Lord to help us forgive because we have been forgiven! My Prayer: Lord teach me to forgive others who have wronged me and honor you as a loving and forgiving Father. Your Word commands it and you continue to forgive me when I have wronged you. Amen.